As you all know that Announcement of Nobel Prize Winners for the year 2017 has been started. 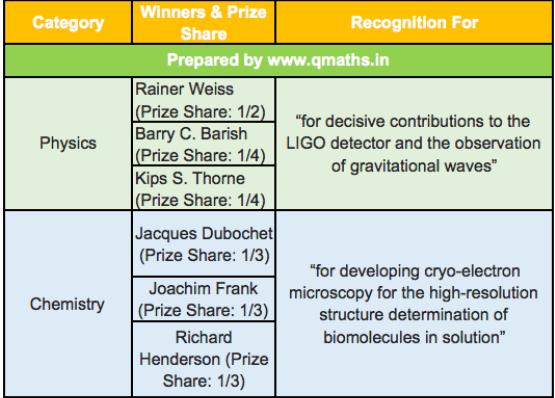 We are sharing a list of Nobel prize winners in each category. we will update this list as and when the names of winners are announced for different categories. Peace International Campaign to Abolish Nuclear Weapons (ICAN) – (Prize Share: 1/1) “for its work to draw attention to the catastrophic humanitarian consequences of any use of nuclear weapons and for its ground-breaking efforts to achieve a treaty-based prohibition of such weapons”. Each category carries prize money of 9 million Swedish kronor (nearly 72 crore in terms of Indian Rupees), which will be given to winners as per above mentioned prize share. Each winner will also get a diploma and a gold medal at the annual award ceremony on 10th December (death anniversary of prize founder Alfred Nobel).